We made it to the end of another week! It’s the end of another good week for running for me, I’m happy to say! 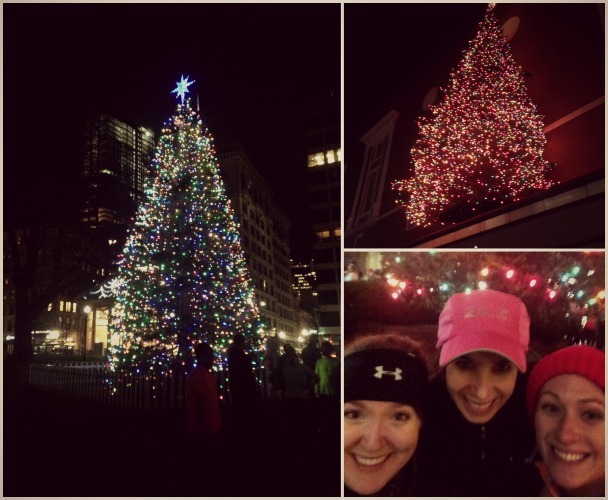 When I had gone to the fun run last Monday night hosted by the running club I’m thinking of joining, one of the girls I had chatted with told me about a $5 Christmas tree fun run in Boston, and had invited me to join her and her friends. $5 for a run, food, and some good ole’ holiday cheer?! I was totally in. The run started from McGann’s Pub in Boston, only a short walk from my office. I headed over on Tuesday evening after work and quickly met up with my friend. 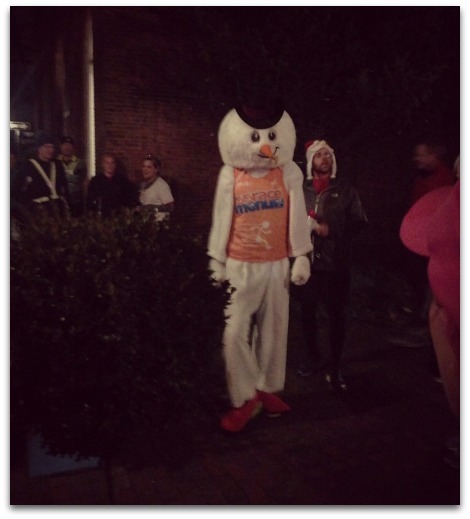 There were a lot of very festive running outfits (think Christmas tree lights, ugly sweaters, full-on snowman costumes…) – I’ll have to work on that for next year since I was seriously lacking in festive running clothes. 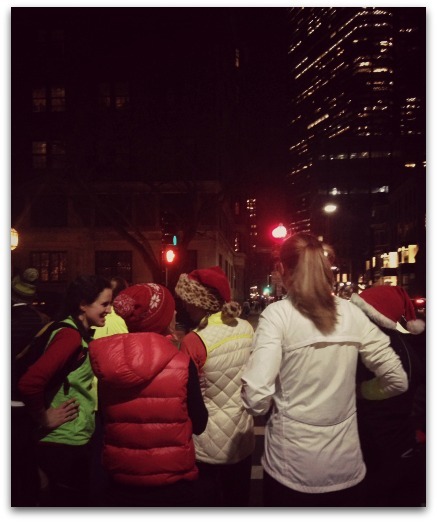 After a little bit of a late start, we headed out on the run to stop at 4 different Christmas trees in Boston. First up on the list was a tree in the Beacon Hill neighborhood. This was a fun run and not a race, so everyone was chatting and relaxed while we ran and clearly feeling the holiday spirit! Sadly, this tree was actually not plugged in when we got there. Fail. Nevertheless, we gathered around and sang Frosty the Snowman, while the real Frosty danced around. Then, it was off to Copley Square! We had better luck at this tree. We also had some GORGEOUS views of the State House from here. Unfortunately, my pictures came out really blurry. 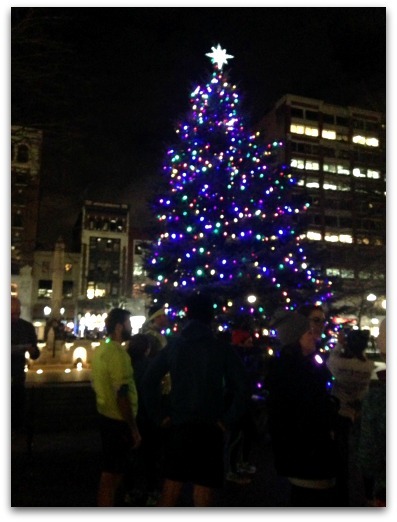 After we sang some more carols (and I began to realize how few words I actually know of Christmas carols), it was off to the Boston Common. 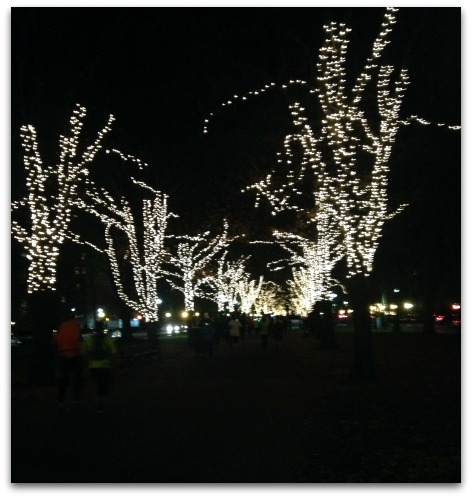 Have I mentioned how absolutely beautiful and festive Boston is right now? It was such a blast running around, taking in all the lights and holiday decorations. I don’t usually see too much of Boston beyond my walk to the subway station everyday during my commute, so it was really cool to see the other parts of the city all lit up and decorated. After more caroling (or humming, in my case), we ran over to the tree that’s on top of the Macy’s store in Downtown Crossing (top right picture). There were a lot more people in this area and they were super confused by our large merry group of runners at first, but then they got SO excited when we started singing carols (even if we were slightly out-of-tune). Last on our list of trees, was Fanuil Hall. This one was probably my favorite. It had blinking lights which made the tree really look like it was sparkling. From there, we headed back to the pub for some drinks and free food! Overall, it ended up being just over a 4 mile run with around a 10 minute pace. Perfect for a relaxed evening taking in the holiday sights. 🙂 And now I can’t believe Christmas is only 2 weeks away!!!! Ahh! Do you have any fun holiday runs coming up? Do you know the words to Christmas carols (beyond the chorus – everybody knows those parts!!)? 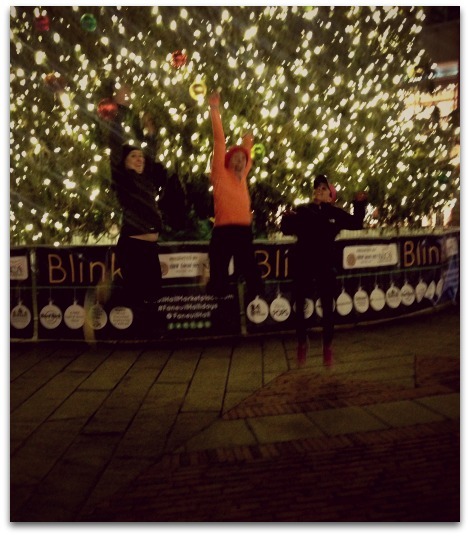 This entry was posted in Races and tagged Boston, Boston Christmas Tree Run, New England, Race Recap, Winter Running. Bookmark the permalink. Ahh this looks like it was so much fun! I’ll have to keep an eye out for runs like this next year 🙂 I’m hoping to run/walk/limp a holiday run in California next week, when I’m visiting my in-laws. Fingers crossed I can actually do it!